Shawn Holmes was born in the cold Canadian prairie of Melfort, Saskatchewan, but moved with his mother to Vancouver Island, British Columbia in 1980. Two years later, a Coleco Vision arrived under the Christmas tree, and his life would never be the same again. 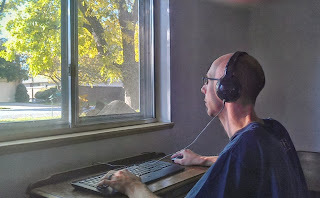 For the next thirteen years, Shawn spent every waking moment doing whatever he could to get his hands on video games, whilst dodging the various non-electronic hobbies his mother tossed his way. As a result of this double life, Shawn experienced the wonder and majesty of competitive sports, the Boy Scouts, and even playing the trumpet in high school band...but these were all distractions from the real objective. By 1995, he owned the NES, Super NES, Sega Master System, Sega Genesis + Sega CD-ROM, Turbo-Grafx 16, 3DO, and even the fabled Neo Geo which played his most prized game: Samurai Shodown II. Shawn's love of SS2 drove him to write the TAPFAQ, drawing the attention of Zoid, who requested it be hosted on his Brawl FTP server alongside a host of other fighting-game FAQs. This introduction led to a friendship in which Zoid encouraged Shawn to pursue computers and the internet in a professional capacity. Shawn then turned to teaching himself HTML while doing technical support for a local Internet provider. A chance meeting with a person in the rec.arts.disney Usenet group selling a movie on VHS led Shawn to follow his gut and move to the United States of America to marry his true love, producing two young video gamers in the process. The Canadian, now firmly planted in Denver, Colorado, continued his passion of computers and the internet by eventually landing a job as an HTML guy, which soon evolved into a ColdFusion programming position. By day, Shawn continued on to build and support applications for clients such as the Denver Broncos and Einstein Bros. Bagels. By night, however, he returned to his passion of video gaming, creating and coordinating a group of players in various online activities, namely Quake and Counter-Strike, a group he named The Millennium Clan. It was through the members of 'milclan' that he was exposed to even more computer games, including Warcraft II, which introduced him to Blizzard's franchise and set him down a path from which there was no return. Shawn has published one book, "Focus on Mod Programming in Quake III Arena", plans to release a book of his memoirs leading Descendants of Draenor in the very near future, and has contributed to gaming sites like Polygon. When he is not playing video games, he enjoys blogging, social networking, collecting MP3s, pop-culture trivia, and gorging himself on the highest form of literature: puns.